He made the request at the Government’s monthly meeting in Hanoi on January 31. Assessing the socio-economic situation in January, he said the positive trend has been sustained, which is a great opportunity that sectors and localities must stay ready to grasp. The PM asked ministers and heads of sectors to pay special attention to realizing the targets of their fields, adding that they need to have regular revisions of their performance and work out suitable and timely responses to domestic and international developments. 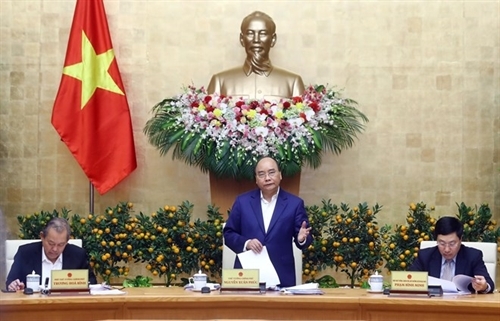 Giving detailed directions to each sector, he told the State Bank of Vietnam to keep steering the monetary policy, exchange rates and interest rates in a flexible manner and in harmony with the fiscal and other macro policies. Its moves must be consistent with the inflation control, macro-economic stabilization and growth promotion targets, the PM stressed. Credit provision should be focused on prioritized fields that are working as growth engines so as to curb loan sharking. Meanwhile, the Ministry of Finance needs to further tighten financial discipline in the use of the State budget and enhance the budget use inspections. The Ministry of Industry and Trade has to take concerted and effective measures to bolster export and control import, PM Phuc said, noting that he had assigned this ministry to build a plan on responses to trade disputes. At the meeting, the Ministry of Agriculture and Rural Development was asked to soon announce the completion of new-style rural area building in some provinces. Meanwhile, the Ministry of Information and Communications was also told to augment efforts to ensure cyber security and strictly deal with actions that take advantage of the freedom of speech and the press to violate interests of the State, organizations and citizens.